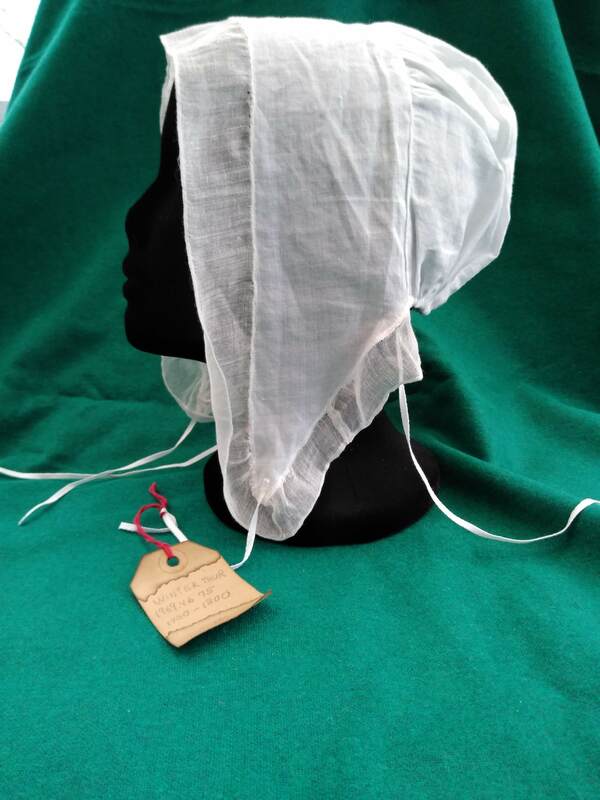 A solid example of an 18th C lappet cap, cotton muslin with a gauzy cotton ruffle gathered only at the turn. Long “kissing strings” gather the caul. Winterthur Museum date: 1750-1800. Their online catalog includes a description, but no image. 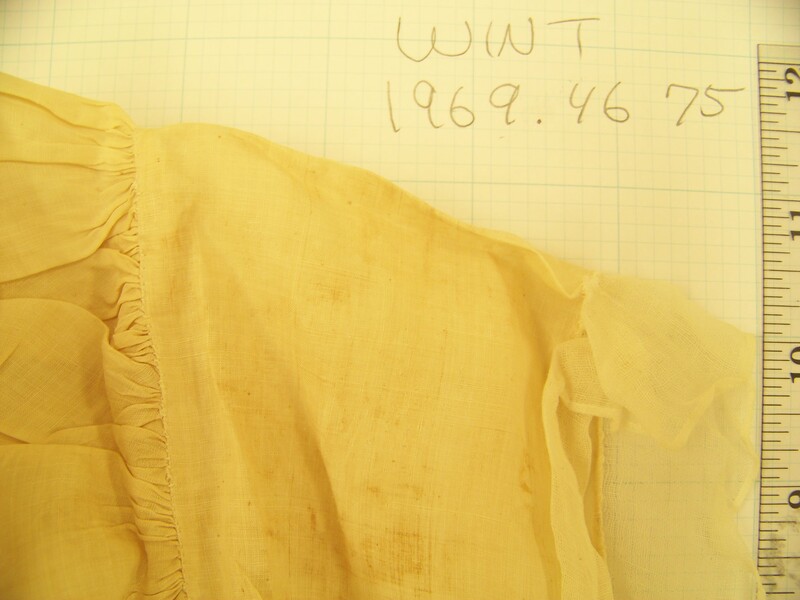 Winterthur 1969.4675, a lappet cap with superfine needlework. The caul, only 7″ tall, with long tapes in 1/4″ casing at the base. 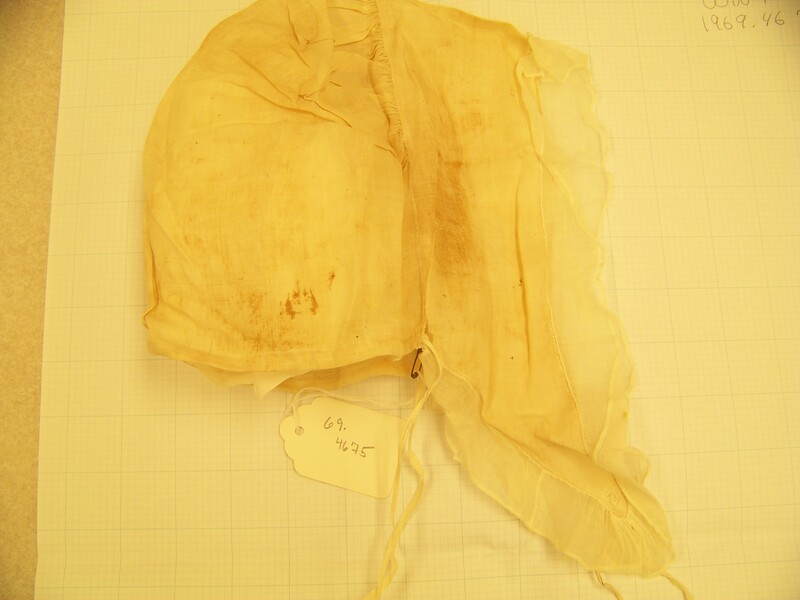 The tapes come out at the front join of the caul and the headpiece. The headpiece, cut on the straight grain, minutely whipped on the front edge. 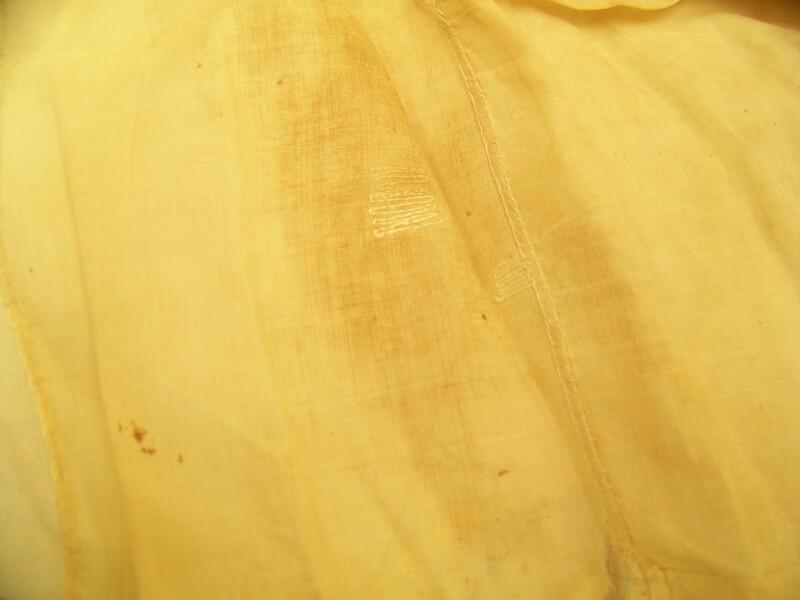 Felled to the caul on the back edge with the world’s tiniest hem (except where it is stroke gathered across the top). 10 1/4″ at the longest point. Ties sewn to the tips are 4 1/2 ” long, sewn to the inside. The gather at the top of the caul is a stroke gathering, unfinished on the inside, across the top 6″ of the arch. I think it was while examining this cap that it hit me what was going on with those long strings, functionally: each one is sewn to the end of the channel on the other side. The strings are doubled inside the channel, so then pulled, they pull against each other and gather up the base of the caul. So these kissing strings maybe have to be long so they can be tucked somewhere, otherwise they hang under the ears and get in the way. But we don’t know where they got tied. See my discussion of this over here. The original has many mended places, perfectly darned. The cap is stained. If I were to pick an example of a “typical” lappet with “typical” construction, I’d pick this one. Its lines are clean and the stitches perfect, nothing oddly cobbled together or poorly executed. Anna Porter Brown (Mrs. Nathaniel Brown). Painted by Joseph Badger, @ 1750. Fine Art Museums of San Francisco. Anna Brown, @ 1750, wears a cap like this one. Its simplicity is echoed in her dress, neckerchief, and sleeve ruffles. Her cap is tied on with a simple white ribbon. Note how it sits back from her face, the ruffles fanning out but not actually gathered. Anna was from Massachusetts, and the clean and fine lines of her garments make me wonder if she is Quaker. The challenge of this cap was to get those edges and joins as small as the original. I used batiste cotton for the body and mull for the ruffles. I’m learning that if I want to recreate really fine stitches, it helps to have really fine cloth — but you already knew that, didn’t you? It also helps to have really fine thread and needles. Ideally, the thread should match the weight of the cloth being sewn, and the needle should not leave a hole bigger than the weave. I’ve resorted to silk thread because it is as fine as a cotton batiste. People often ask me where I get my cloth. I go to the normal reenactors’ suppliers: Wm. Booth, Draper or Burnley and Trowbridge. Their finest linens and organzas are close enough to get the look right. The really fine weight cloth (3.5 oz or lighter) is expensive, but a cap takes 1/4 or 1/3 of a yard, so that makes it seem almost affordable. I don’t live near to any big cities with a garment district, so when I travel I try to get to good fabric stores, but even these have very little. I also buy linen blouses and Indian cotton skirts at second hand stores and take them apart. These often have finer cloth than I can find by the yard. 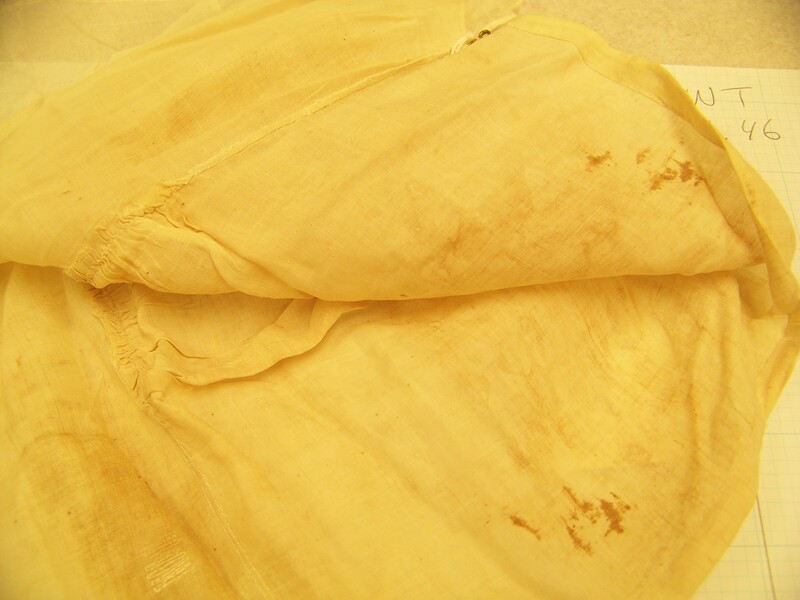 I once got a whole stack of cloth at a Goodwill — must have been a reenactor who never got around to things. The mistake I made on this cap is I put the lappet tapes on the outside, and they are supposed to be on the inside. I am not aware of any further research on this cap.